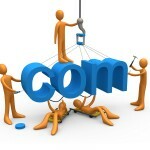 Ideally, you should use your business name as your domain name. For example, if you have a business named SmallBiz Consulting, your first choice should be SmallBizConsulting.com, since people will easily remember it. If this name is not available, choose something similar to your business name. For example, our domain name SmallBizWebDesign.ca, we use the key word, web design and small biz, as the most important part of our domain name. We know that when people are looking for a web design company online, they will type phases like “web design company in Vancouver”, etc. There is Search Engine Optimization (SEO) advantage for using key words in your domain name. Welcome to SmallBiz Web Design!